Today we had the honour of receiving nine students and their four teachers from Loopabroad. 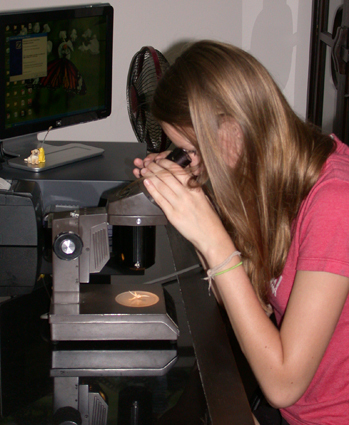 These American junior high school students focus on tropical ecology and they were particularly interested in the Orchid Ark. We spent a couple of hours of fun, pollinating orchids and strolling in the garden chatting about many different tropical organisms; ants, fruits, trees, wild boar…….I love my job! 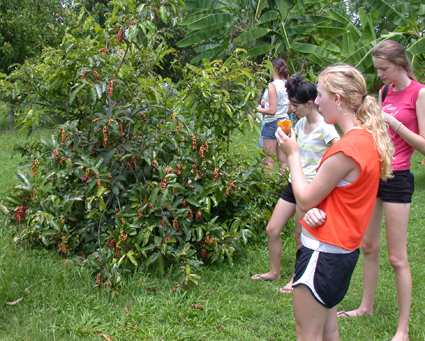 Loop Abroad student Lucy examines a native Eria javanica orchid flower, preparing herself for pollinating a living flower. The Orchid Ark needs orchid fruits so hand pollination is sometimes necessary, and also teaches students about orchid biology. The slightly fragrant Eria javanica (Orchidaceae). 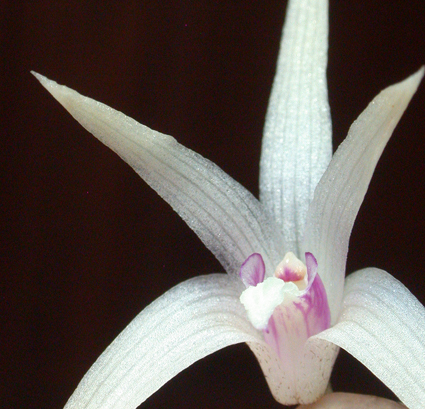 We discussed the importance of catchy vernacular names to create an interest in orchids. How about ‘crystal fountain’? Update August 26, 2011: It worked! 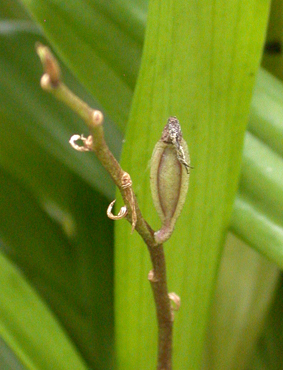 A fruit of Eria javanica is forming. Although this orchid plant had many flowers, the absence of a natural pollinator prevented fruit formation. Thanks to the students we shall have many seeds for its propagation! Fruit tasting! While still eating fresh ‘star fruits’ (Averrhoa carambola, Oxalidaceae) we also examined the ‘tropical cranberry’ (Antidesma bunius, Phyllanthaceae). Regarding Antidesma bunius: นะเน่าดง (Ma Maodong} is one of the four “Thai Plant Names” given by the Forest Department , one of two for use in the ChiangMai area. All four names include the syllable เน่า (Mao).